Five-time champion Greig Hutcheon (pictured) battled the toughest conditions on a windy first day at the 2018 Emtec Group Deer Park Masters to sit two shots clear at the top of the leaderboard overnight with an impressive score of five-under-par 67. Hutcheon was awarded an honorary membership of Deer Park last year in recognition of his achievements in this event and he got off to the perfect start with an eagle on the par-4 first hole after finding the green with his opening drive. That good form continued throughout the rest of his round and he now sits in a strong position as he targets a sixth title in just 15 years since the Emtec Group Deer Park Masters was first staged. 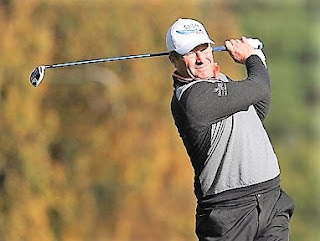 The Paul Lawrie Golf Centre man will face stiff competition for the trophy, however, as North Lanarkshire Leisure’s Paul O’Hara is just two shots back on three-under-par and he will be looking to mount a serious challenge on day two. The Deer Park Masters continues tomorrow when all 50 PGA professionals return to the acclaimed West Lothian lay-out for their second round with a further 150 amateurs taking part in the biggest pro-am event on the Tartan Tour circuit. 69 P O’Hara (North Lanarkshire Leisure) 70 C Currie (Erskine), G Wright (West Linton). 71 R. Munro (Duddingston), M Owenson (Gullane), N Fenwick (Dunbar), Z Saltman (Winterfield), T Higson (Gleneagles Hotel). 72 I Graham (Crow Wood, J McGhee (Swanston New), A Forsyth (Mearns Castle), R Arnott (Bishopbriggs). 73 C Kelly (Scotland for Golf), S Gray (Lanark), C Ronald (Carluke), K Nicol (Dunes). 74 G Hay (Mearns Castle), P McKechnie (Braid Hills), F Rummins (Canmore), V Brown (Logos Golf Ministries), J Steven (Pumpherston), S O'Hara (North Lanarkshire Leisure). 75 R Tinker (Piperdam), G McDougall (Elie Links), I Stoddart (Deer Park), J McCreadie (Largs), F McKenna (Caldwell). 76 P McGhee (Royal Burgess), M O'Donnell (Stirling), A Welsh (Cathkin Braes), C Marr (Musselburgh). 77 S Houlden (East Kilbride), C Imlah (Craigielaw), C McMaster (Downfield), D nicol (Dundonald Links), D Lee (American Golf). 78 R Cameron (unatt), N Cameron (Blairgowrie), G Paxton (Ralston), P McKenna (Portlethen), K Zeynalov (Portlethen). 79 R Leeds (Archerfield Links), R McConnachie (Peterculter), M Kanev (Lochgelly), C Nairn (Prestwick St Nicholas), J Treasurer (Loch Ness), S Henderson (Kings Links). 80 S Grant (Scotscraig), A McHardy (Noah's Ark).